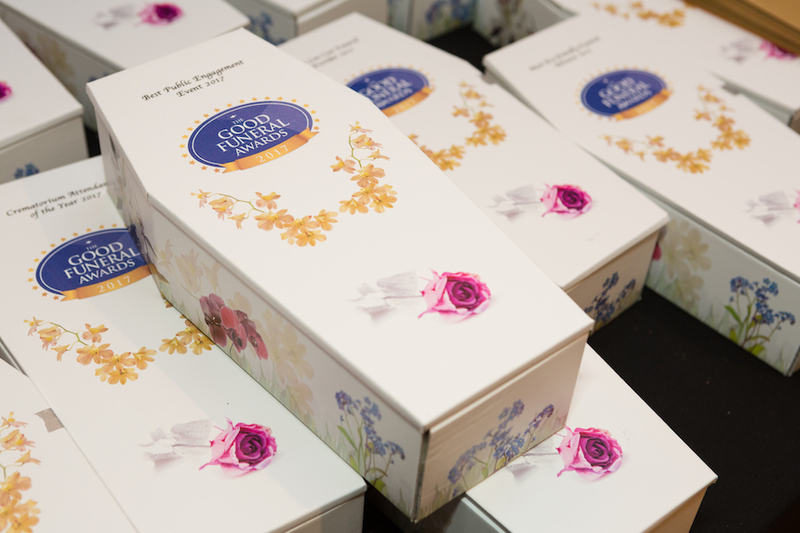 Once seen as the quirky province of the industry’s ‘progressives’, the Good Funeral Awards – the ‘Oscars’ of the bereavement care world – now embrace all the elements. A few years ago, you’d have got fairly long odds on a bet that the mainstream media would be interested in the winner of the ‘Gravedigger of the Year’ title. But thanks to the launch, seven years ago, of the Good funeral Awards (GFAs), such otherwise unsung heroes have been profiled in the national press, interviewed by the likes of the BBC and captured the public’s imagination. The GFAs have probably brought more public attention to the funeral world during their lifespan than almost any other event, highlighting the wonderful work done in this under-appreciated and much misunderstood arena – and doing it with just a touch of British humour. The delight shown at this year’s ceremony, held at London’s Porchester Hall and presented by writer Guy Browning, also emphasises the benefits of this public recognition. The long list of nominations and 250-strong audience spanned a huge range – from new entrants, to entrepreneurs and pioneers, all the way up to doyens of some of the country’s oldest funeral firms. The categories have evolved and more awards have been added so, while funeral director, celebrant, crematorium, gravedigger are all still there, so now are awards for doulas, eco-friendly funeral directors, death-related public events and funeral caterers. There are also titles that reflect the zeitgeist, such as ‘Direct cremation provider’ and ‘What to do with the ashes’. Under the current system, the initial nomination comes from the public, then nominees are asked to submit information and judges pick a winner. Some categories attract larger line-ups than others – for example, there were 28 shortlisted funeral celebrants but only three on the final line-up for Minister of the Year. However, that may say more about ministers’ reluctance to sell themselves. The judges’ praise encompassed JC Atkinson’s innovative multi-panelled Pathways coffin, which allows all the family to be involved in creating the coffin, as well as pioneering approaches and dogged persistence. There was also acknowledgement that such roles as gravedigger are about more than just digging a hole. Alongside the newer names, the winner of the Lifetime Achievement Award added an air of venerability. Clive Leverton, who led both Princess Diana’s and the Queen Mother’s final farewells, was a popular choice for award and received a standing ovation. Judges said Clive’s insistence that all clients receive the same level of care and attention to detail as royalty has earned him widespread respect and affection. They also emphasised his lack of resistance to trying something new, such as pioneering the use of an electric hearse. Another special award received a similar reaction, with Louise Winter playing tribute to the achievements of Jon Underwood, founder of Death Cafés, who died at the age of only 42, a few months ago. Jon’s sister accepted the award and pledged on behalf of her mother and Jon’s family to continue his work helping people do just that. For more information and a full list of winners, runners-up and nominees, go to: http://goodfuneralawards.co.uk/.